Aphrodisias is unquestionably one of the most impressing ancient cities of Anatolia with its well-preserved buildings and numbers of magnificent sculptures from the Roman period. Being built near a marble quarry, the city was also an important center in the past with its famous sculpture school and for being one of the several cities that was dedicated to Aphrodite, the goddess of love. The city was named after Aphrodite in the second century BC. but according to the Suda, before being known as Aphrodisias, it had three previous names: Lelegon Polis, Megale Polis and NinoÃ«, a name derived from Ninos. Ninos was the mythical founder for the Assyro-Babylonian Empire and the husband of the famous Semiramis. The city was later renamed as Stauropolis in the Cristian Era. 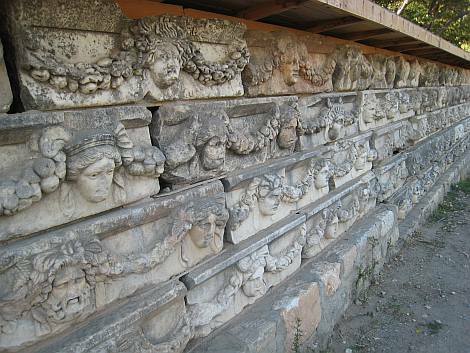 Aphrodisias was not the city of famous sculptures only, but it was also a hometown for renowned scholars and philosophers. The philosopher Xenocrates, who had been a student of Plato, is believed to live in Aphrodisias. The excavations at the city have been held systematically since 1961 by deceased Professor Kenan Erim, whose grave is now near Tetrapylon.